ploughing the fields in Ukraine is another. 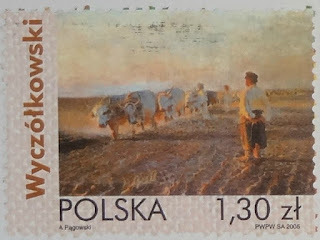 the stamp is designed by Andrzej Pągowski who is mostly known for his posters, but he has also designed billboards, logos, cd and magazine artwork as well as "co-operating with the Polish Postal Service – designing stamps, sitting on the committee which evaluates projects, and searching for new designers". This is another great set for today's theme. I like the combination of realism and minimalism. I was so excited when I found those babies at the stamp fair! Isn't the sunlight wonderful?! I am imagining it was late evening when this scene was painted. I'd love to see that original painting. 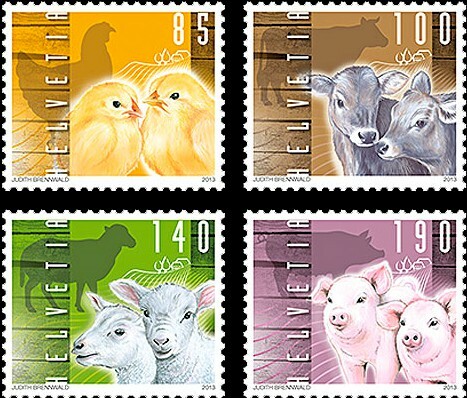 The Swiss stamps are delightful. 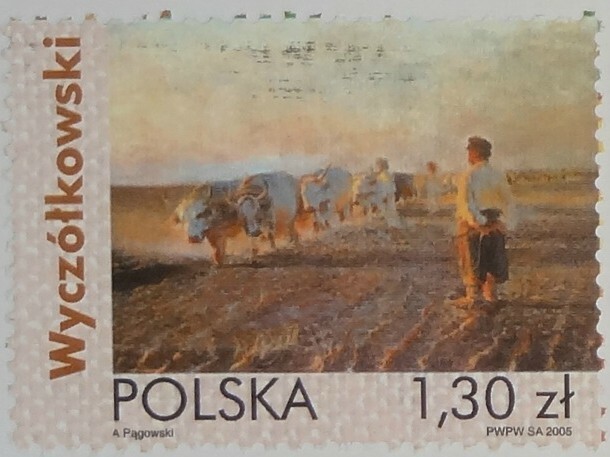 I don't usually like paintings on stamps as I don't think they show up all that well, but this one works well. I wonder how big the original is? they do, don't they?! how are you?? Oh, yes, the sunlight in the painting is beautiful! Also I was thinking of Galicia in Spain, but now I learned (thanks to you and wikipedia) that there's a Galicia in Eastern Europe, too. This is (co-incidentally) the second post in a week that I've tried to navigate through Polish and Ukrainian history - it's so very confusing!